I usually schedule work for galleries and shows using my computer database but when I have several galleries to rotate at once, it gets confusing. 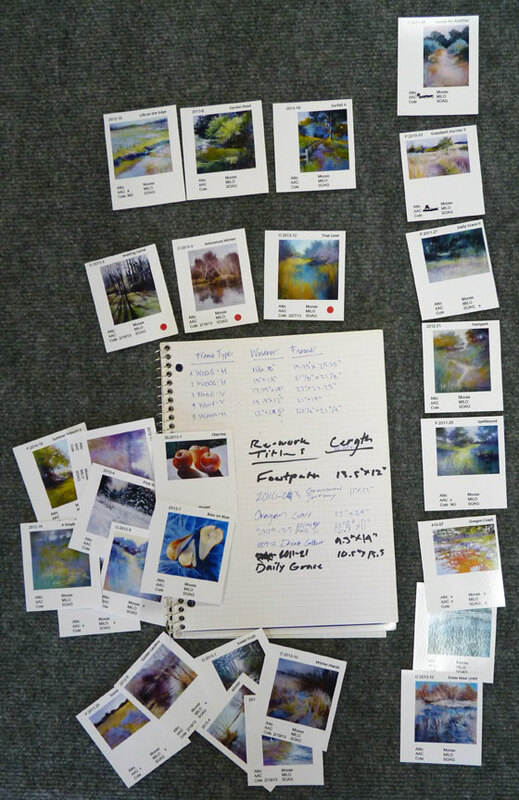 This time, I printed glossy color thumbnails of each painting to help me quickly see how a group going to a gallery will look. Our grandsons, ages 13 and 11, stayed with us last week and helped me in the studio one afternoon. We hung the pieces for an upcoming show on one wall for a preview. The cool blues and purples of the pieces should be a welcome sight for the August show if today's temperature of 84 degrees continues. We also rotated work at one of my galleries and I was happy to have the boys with me to carry paintings. 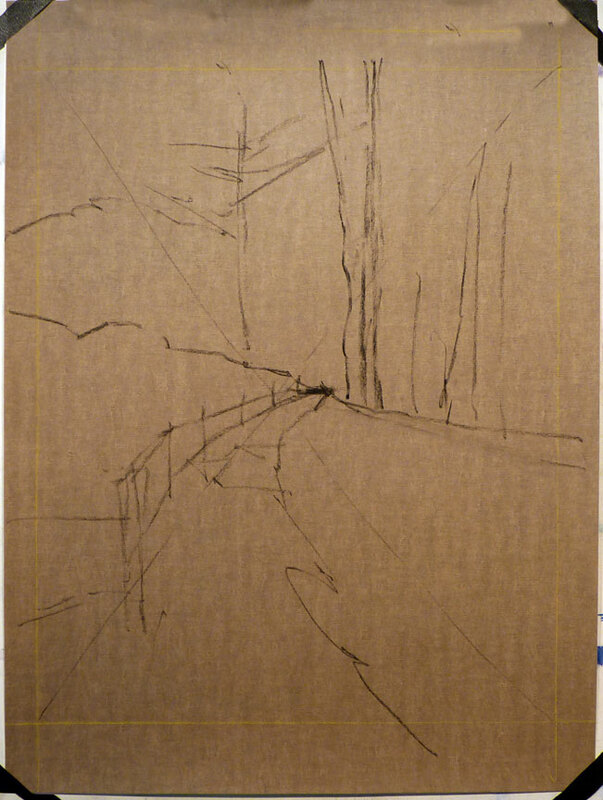 Of course, this is the one time I got a parking place right in front of the gallery instead of the usual two-block hike up and down a hill! 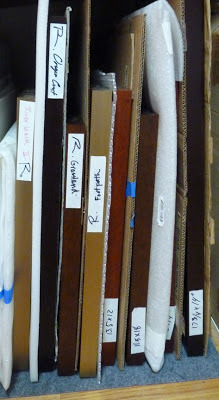 When we reorganized my inventory, I identified several paintings for rework. For these paintings, one boy measured the window and the frame and the other one wrote the information in a spiral notebook. We wrote a big R for "rework" on low-tack tape to label the edge of the frame that shows in my storage area. Now, the boys are gone and I'm ready to get back to work in the studio. I hope to get some early morning plein air work done this week and will begin to take reference photos of the gardens and surrounding landscape for my July workshop here in case it rains. 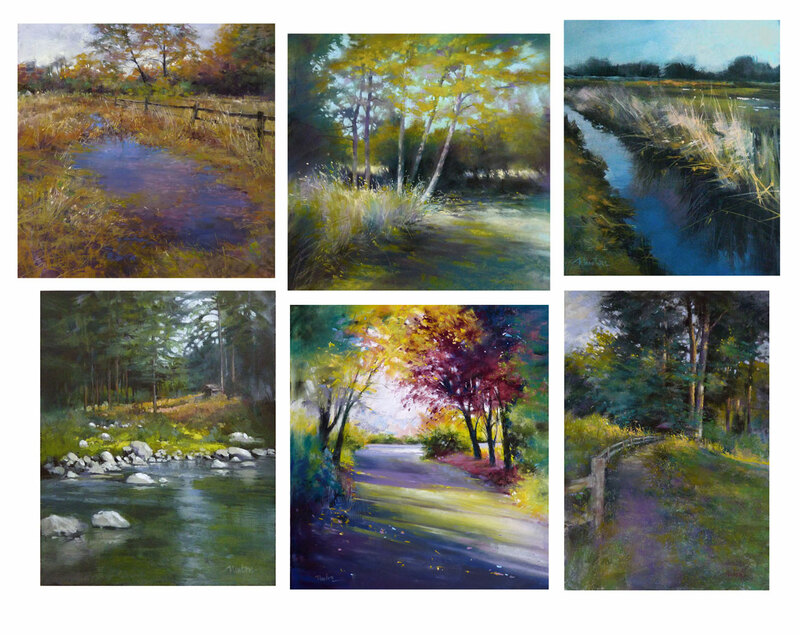 One of the highlights of my summer will be the installation of six of my paintings (four pastels and two oils) at the Puget Sound Blood Center Lab in Renton, Washington. I am honored to be in their Collection of original works. Many thanks to Cole Gallery. A couple weeks ago, I helped install "Sunfall" at the Puget Sound Blood Center Lab in Renton, Washington. 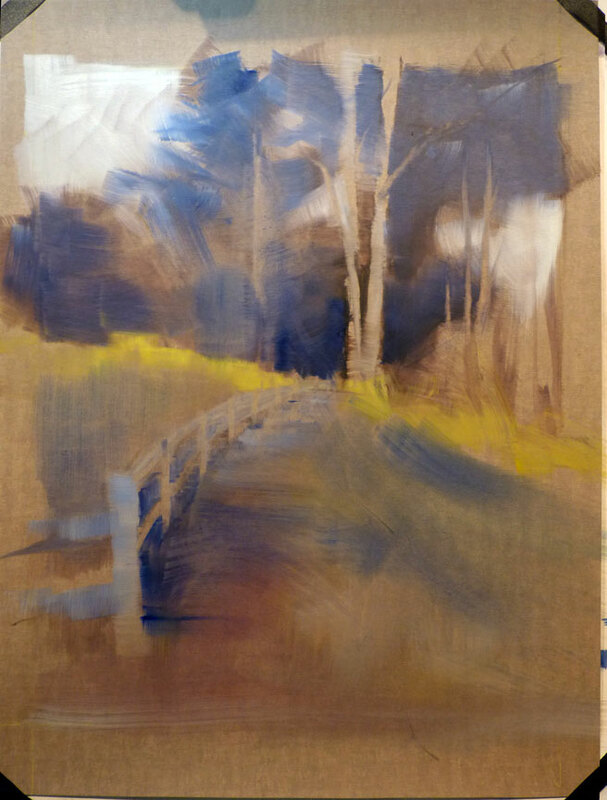 This week I started a similar version but larger this time, at 20 x 16 inches. 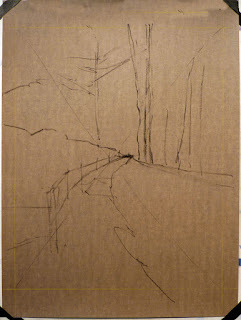 This first step is the line drawing in charcoal on Belgium Mist Wallis sanded paper for "Sunfall II." Next, a thin oil-wash foundation. The finished painting, "Sunfall II." A more colorful version with bolder marks. I was selected for this book so long ago that I forgot about it until today when I received notice that it can be pre-ordered at Amazon or Barnes & Noble now. I don't see myself on the cover but I'm happy to have my work included inside. 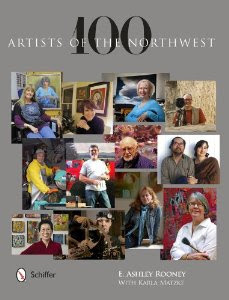 100 Artists of the Northwest. The works of 100 contemporary artists interpret and provide a fresh look at the artistic vibrancy of the Northwest region of the United States. 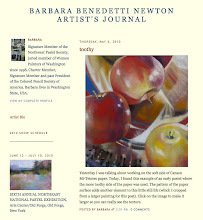 The states of Oregon and Washington are rich with artists, having become vital art scenes in the past several decades. Using sculpture, glass, oil, clay, wood, and other contemporary mediums, as well as paint, these 21st century artists combine, redesign, and transform their materials into pieces of works that change the way we perceive both the regions of the Northwest and the world. With a guide to galleries, sculpture parks, museums, and schools, this book is a wonderful resource for lovers of all art mediums. I'm not a fan of traveling...a day spent at home in my studio is the norm for me but it is my favorite place to be. 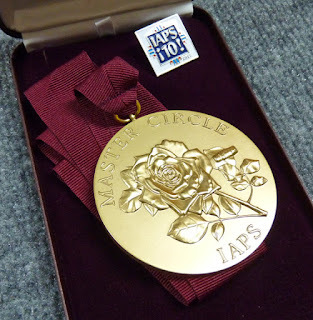 When I received notice last year that I had earned acceptance into the Master Circle of International Association of Pastel Socities (IAPS) I was honored, but my second thought was uh-oh because I knew the IAPS-MC medals were presented at the Convention that takes place every other year in Albuquerque, NM. So, like it or not, it looked like I'd be traveling. I'm back now and this truly impressive medal is with me in the Studio. I'm so glad I went and of course, I'm so glad to be back. The Convention is a big party with all the rock-stars of the pastel world there. I had the opportunity to meet artists I'd previously known only via the internet and also to reconnect with old friends. 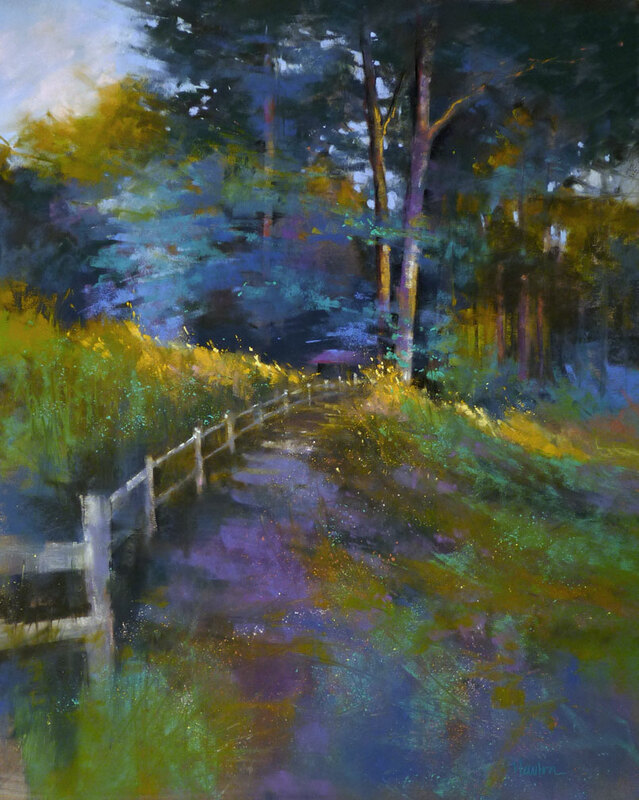 It was extra special to have served as one of the three Jurors of Selection for the 22nd Juried Exhibition. The art in that show, as well as the work in the Second Master Circle Exhibition, was outstanding. 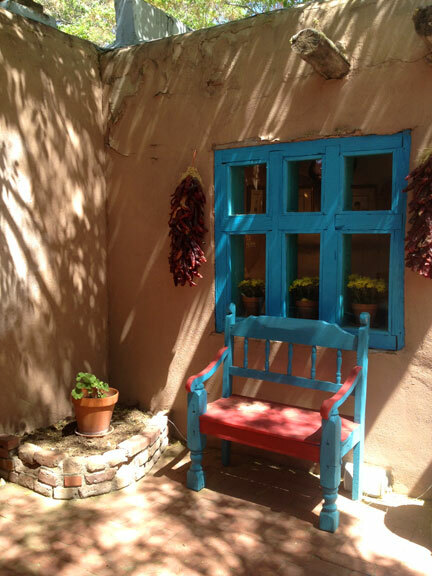 Old Town is charming, colorful, and funky. We took a walking tour that was fun and educational and we enjoyed the morning warmth but avoided the afternoon heat. Lunch at La Crepe Michel (twice!) was a highlight as was the twisted lemon ice cream cone from a nearby shop. I'm looking for a window or door to paint Virgin Mary Blue, preferably West-facing to ward off evil. And, if not for this honor, I might have gone my whole life without knowing how to spell Albuquerque! IAPS is made up of pastel societies from around the world. Find a pastel society near you.